But it’s time to revisit the 1947 decision to separate the Air Force from the Army. While everyone agrees that the United States military requires air capability, it’s less obvious that we need a bureaucratic entity called the United States Air Force. The independent Air Force privileges airpower to a degree unsupported by the historical record. This bureaucratic structure has proven to be a continual problem in war fighting, in procurement, and in estimates of the costs of armed conflict. Indeed, it would be wrong to say that the USAF is an idea whose time has passed. Rather, it’s a mistake that never should have been made. As a child of the 50s and 60s MUDGE cut his teeth on Joseph Heller’s Catch 22, which ought to be required reading for all (and which I believe helped make draft dodgers out of huge swathes of the sons of the Greatest Generation, whose Air Force Heller eviscerates). So I’ve long been suspicious of the value of strategic bombing, which was designed to undermine the enemy’s ability to prosecute war by crippling its industrial base, and as the years have passed, and my reading of history has expanded well beyond the comic novel, my suspicions have become sureties. Before we continue, I need to stop. What is written here is meant to cast no aspersions on the competence, courage and loyalty of the personnel in the cockpits and the equally dedicated people who support them on the ground. Indeed the official nephew of Mr. and Mrs. MUDGE is completing his senior year at a major university as a high performing member of Air Force ROTC and we couldn’t be prouder. This is about the generals and the politicians who coddle them. Strategic and not tactical. I love you gals and guys in the trenches, and the shiny (or anti-reflective stealthy as the case may be) warbirds you fly and you keep in the air. This is only about those who direct you from the air conditioned D.C. offices. Those guys. During the first years of the U.S. involvement in the European theater of World War II, strategic bombing was the only way for the U.S. to take the fight to Germany, but was a terribly costly way, and did not provide the overwhelming blow that its then Army Air Force proponents promised. But, strategic bombing is what the Air Force was selling, and just after the successful end of the war Congress bought it. Strategic bombing performed by the now independent Air Force did lots of work, but failed to win the wars against North Korea, or North Vietnam. Arguably, airpower did succeed on its own in bringing victory in the 1999 Kosovo War. For 78 days, the NATO alliance bombed Serbian military and infrastructure targets in order to force Serbia’s withdrawal from the province of Kosovo. After increasingly serious threats of a ground invasion and the end of Russian support, Serbia succumbed to the NATO occupation of Kosovo. Even acknowledging the decisiveness of the airstrikes, however, the ability of a small country to stand against the world’s most powerful military alliance for almost three months does not speak well of the coercive capacity of modern airpower. And now, strategic bombing seems to have an uncertain place in the type of asymmetric warfare the U.S. is fighting today. There has been something “off” about the Air Force, especially in recent years. The scandals at the Air Force Academy, which as one of the comments to the American Prospect story reminds us, is increasingly fundamentalist Christian in its orientation (anyone recall separation of church and state?) and where sexual harassment (an unfortunate and nasty feature at all of the military academies) has been particularly ugly. Another aside: During the years the official son of Mr. and Mrs. MUDGE was a midshipman at the U.S. Naval Academy, we were proud members of the local parents organization, so we were in a better position than most to understand the very much harder than hard road that women midshipmen and cadets face at all of the Academies. And now one of those stalwart women, who went on to distinguished service in Japan, the Gulf and Washington, D.C., is now our lovely daughter-in-law. Are we lucky! A third aside: I remember distinctly learning from a Naval Academy recruiter at one of those parents association meetings in the early 1990s that at the time, due to the post Cold War drawdowns of forces, there were actually more flight berths on offer to graduates of the Naval Academy (remember, all those floating airports, the Navy’s carriers) than for the Air Force. 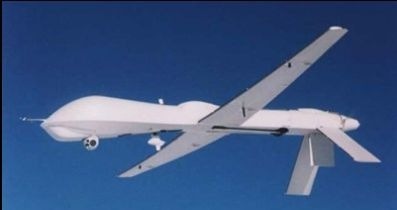 Finally, as covered in several posts here recently, the air is increasingly filling with remotely piloted aircraft, the UAVs and UCAVs, most of them flown by enlisted personnel at consoles thousands of miles away. Not exactly Eddie Rickenbacker or Chuck Yeager, is it? Did you catch the heart of the argument? If strategic bombing won independence for the Air Force, yet strategic bombing cannot win wars, it’s unclear why the Air Force should retain its independence. Note! : the link to Amazon.com used above is for the convenience of faithful reader and represents no commercial relationship whatsoever. Left-Handed Complement should be so fortunate as to ever collect remuneration of any kind for this endeavor. I can link, so I link. It’s technology. It’s cool. Deal with it. This entry was posted on Friday, November 2nd, 2007 at 10:30 pm and is filed under Air Force, Geopolitics, History, musings, Politics, Technology, War. You can follow any responses to this entry through the RSS 2.0 feed. You can leave a response, or trackback from your own site.